WILLIAMSPORT, Pa. – ESPN Williamsport and its affiliates will remain the flagship for Lycoming College athletics in the 2016-17 academic year, as the college and radio conglomerate have announced an agreement for all football and basketball games during the season. 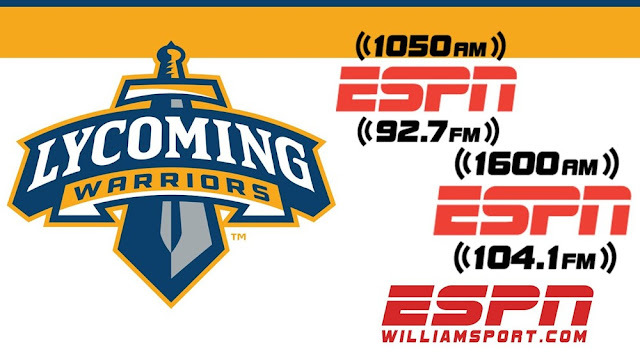 ESPN Williamsport has been the official radio home for Lycoming sports for the past eight seasons. ESPN Williamsport entities (1050, 1600 AM, 104.1, 92.7 FM and espnwilliamsport.com Stream 1) carry all of the Warriors' football and men's basketball games as well as nearly all the women's basketball contests. Programming includes pre- and post-game shows. All of the Warriors' ESPN Radio broadcasts are streamed online through www.espnwilliamsport.com and through smart phones on Tunein radio, allowing Warrior fans throughout the world access to the broadcasts. During ESPN Williamsport's eight years of coverage, Todd Bartley, the voice of Warrior athletics and the station's owner and general manager, and his broadcast teams that include Jerry Girardi for football and Seth Burch and Robyn Hannon for basketball, have covered two MAC football championships, four appearances in the MAC Commonwealth finals and two NCAA Tournament appearances in men's basketball and three appearances in the conference playoffs in women's basketball. In April 2012, Bartley was recognized by the Pennsylvania Associated Press Broadcasters Association with a first-place prize in medium market play-by-play for his work during a tense, one-point men's basketball game between Lycoming and Widener. ESPN Radio is the country's largest sports radio network, providing more than 9,000 hours of talk and event content annually to 750 stations nationwide, including the top 100 markets.